Our standard hail & bail frames are completely customizable. We do all of the plates in house and specialize in color dye sublimation to create a truly unique frame for your command. All photos are printed on wide format EPSON printers and Photoshop editing is done when requested or as needed. Standard CPO Package includes new CPO Creed, CPO Anchor, Customized Nameplate, new Warriors of Character CPO Coin and, of course, the ever famous Wallet Card. 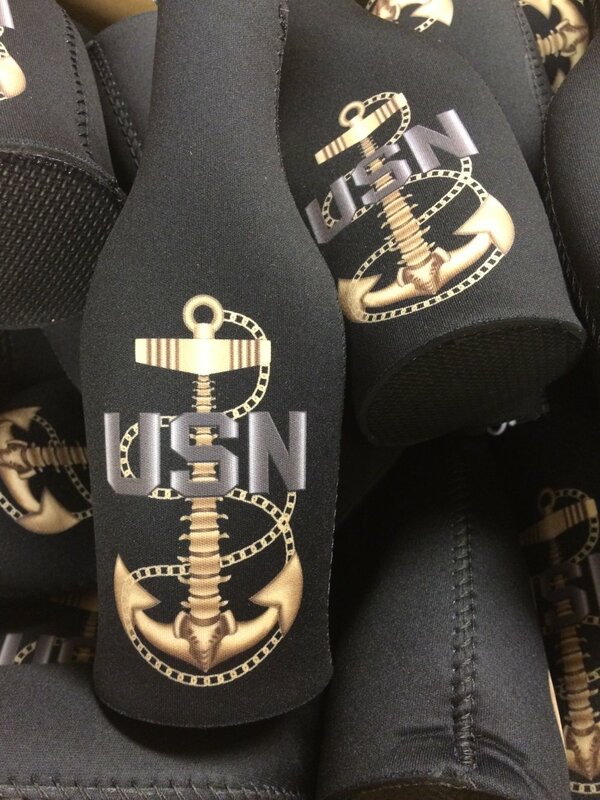 Also included is the BACKBONE window sticker and beer bottle koozie. You also have the option of including your command CPO coin in the frame in place of the WOC CPO coin, and receive the WOC CPO coin with your package extras. All of our frames are customizable to include whatever devices, coins or patches you want to add in. 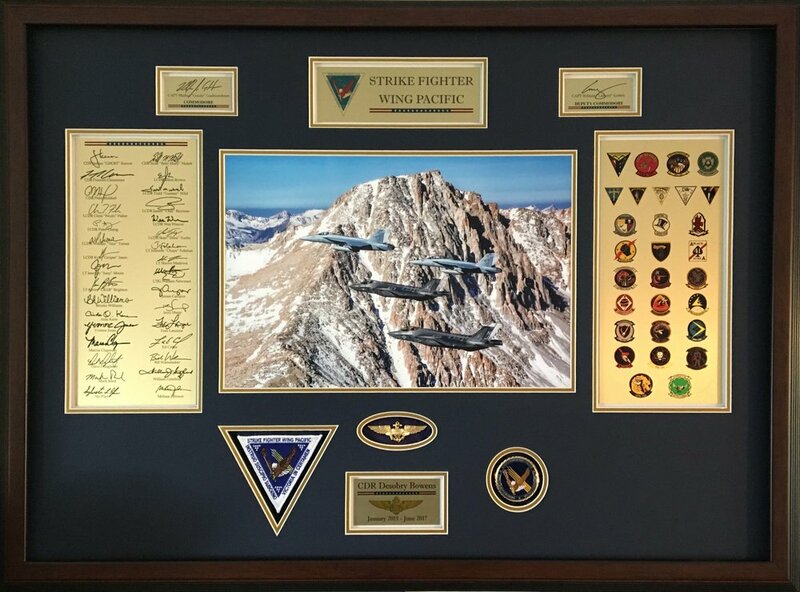 Commissioning pennants and command patches need to be provided, we can supply devices, nameplate and photos. 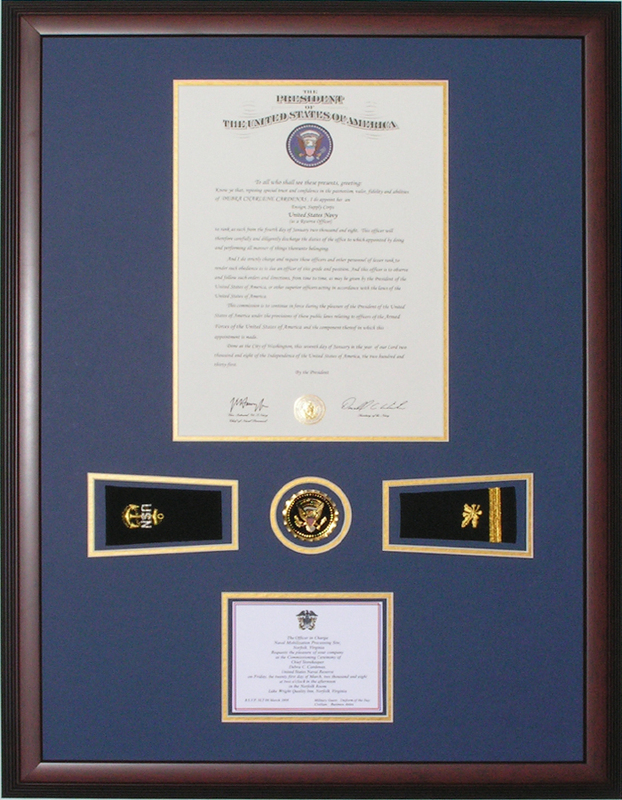 You can create a unique Commissioning Frame with soft shoulder boards, devices, your certificate and ceremony invitation (optional) which will make your event memorable. The certificate will need to be sent for mounting in the frame. To commemorate your well-deserved retirement, we can create a custom layout to cater to your specific needs. We stock most standard medals, ribbons, warfare devices, shoulder boards and Flags. 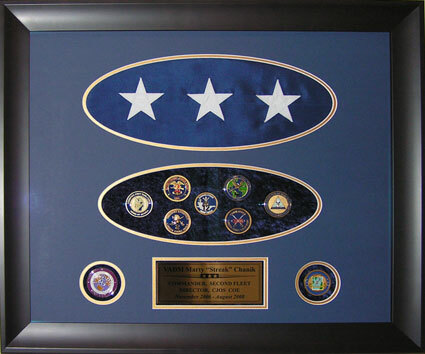 Our unique duty station plates showcase your Military career with graphics and, in some cases, photos right on the plate!